Just three days after releasing Windows 10 Creators Update build 15002, Microsoft has showed off even more features from the Creators Update releasing to the public in April. The company released yet another feature-packed Windows 10 Preview build 15007 last night to the Fast ring Insiders. This time, however, the build is available to both the PC and Mobile Insiders. “Pick up where you left off,” downloadable themes, Reset app, and more! While the build is packed full of features, the latest Windows 10 Preview build 15007 also makes it easier to work across multiple computers. In this build, Cortana shows quick links for cloud-based documents, recent work, and Edge websites, when you switch a different machine. “If you were working on a PowerPoint deck on your laptop, when you later return to your desktop, a link to that deck appears in the Action Center,” Microsoft wrote in the announcement post. The build is further making it easier for Edge users to share tabs with other apps, making it easier to switch from one browser to the next without losing track of tabs. 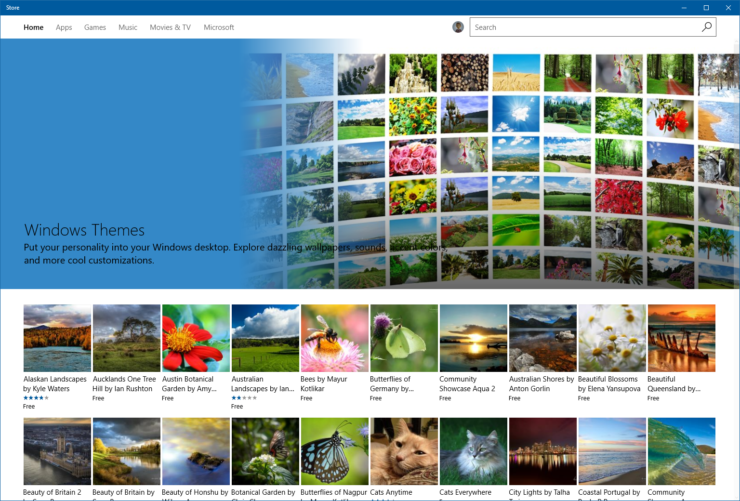 Microsoft has promised to let you download themes for your PC from the Windows Store. “In Build 15002, we introduced the new themes settings page in the Settings app. Soon, you’ll be able to go directly from the themes setting page directly to the Windows Store to download new themes for your PC!” The feature is tagged as coming soon. Along with App reset function, there are a number of improvements for Edge users too. Mobile Insiders using Edge can now zoom into websites up to 500%, regardless of website settings. You can now also click on site links to open a page in the corresponding app on websites that support web-to-app linking. Mobile users can also now sync passwords, Wi-Fi profiles, and browser favorites, among other app data. For the complete changelog, please visit this lengthy blogpost detailing all the changes and known issues coming with Windows 10 Preview 15007 for PC and Mobile. 2017 is certainly bringing some awesome features to Fast ring Insiders. Looking for some particular feature or improvement? Let us know what more you’d love to see in the Windows 10 Creators Update.